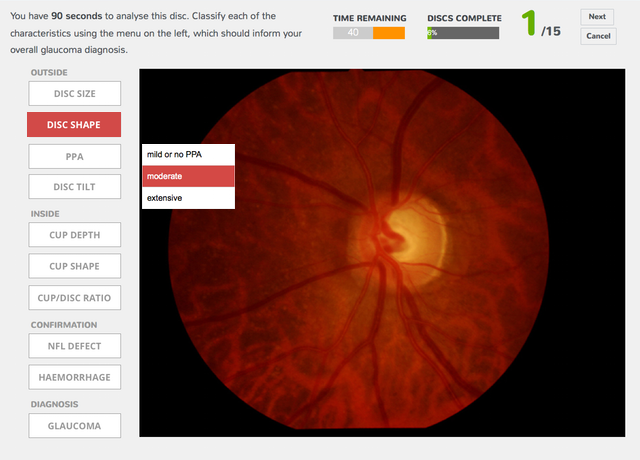 The main part of the test screen is the optic disc. On the top left corner is a clock that informs the participant the time spent on the disc. The top navigation bar informs the participant the number of discs completed and allows the participant to navigate to the next disc if you have completed the current disc before allocated time. Navigation to previous disc is not allowed but test can be stopped at any time. The left side bar are questions about the disc features that the participant is required to answer. A pop-up menu containing available options will appear when the mouse moves on to one of the buttons.